posted by Howard B. Owens in Andrew Cuomo, batavia, downtown, news. Perhaps the third time is a charm. Gov. Andrew Cuomo, after twice before scheduling announcements in Batavia and then quickly canceling the trip, has once again put Batavia on his schedule. Cuomo is expected to be at City Hall tomorrow at 1 p.m.
Members of the public who wish to attend are asked to RSVP. The nature of the announcement has not been released, but Batavia is a candidate for a $10 million economic development grant and Cuomo has been traveling around the state in recent weeks announcing the grants in each of the 10 economic development regions. The winner for the Finger Lakes region has not yet been announced. 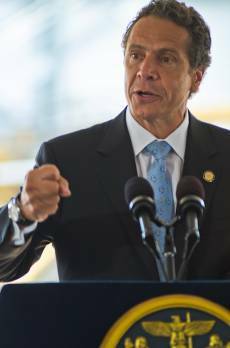 posted by Mike Pettinella in news, Andrew Cuomo, batavia, GCEDC, business. New York is one of the largest dairy producers in the country, being home to nearly 5,000 dairy farms and more than 600,000 dairy cows. And the majority of the farms in the state are family-run operations -- that's why it's crucial the state invest in hard working New York families and ensure they have the support they need to succeed. Tomorrow, I am announcing the details of a new partnership that will create hundreds of new jobs at an idle dairy facility in New York. Join me tomorrow, July 11th at 12:30 p.m. as I unveil the details of this new investment. WHEN: Tuesday, July 11th at 12:30 p.m. Thank you for your support, ever upward. posted by Howard B. Owens in Medicaid, news, Andrew Cuomo, chris collins. It's just two partisans fighting, County Manager Jay Gsell said of a proposal to shift money around so that counties in the State of New York could get relief from the unfunded mandate known as Medicaid. Gov. Andrew Cuomo is backing legislation called the Empire State Equity Act, which would shift back to New York, some $30 billion in taxpayer money from the federal government to the state. With that money, the state then could assume the cost of the $2.3 billion shelled out by counties now to support Medicaid, but only for counties that agreed to cut local property taxes by the amount of their current share. That could be $277 average savings per property in Genesee County, according to a chart released by the governor's office. Where the governor sees tax savings for county residents, Gsell sees smoke and mirrors and political rhetoric aimed at Rep. Chris Collins. "It's a political war of words between two people, Collins and Cuomo, who seem to really dislike each other and engage in negative partisanship to the max," Gsell said. The way Gsell sees it, the proposal is asking the feds to "artificially" adjust a funding formula for New York, which is similar to something Schumer did temporarily a few years ago, and give it the "innocent sounding phrase, 'Empire Equity,' and then only provide a cost shift." Gsell noted the benefit level -- a cause of the state's high Medicaid expense as he sees it -- wouldn't be cut under the governer's proposal, which leaves him distrustful of the long-term effects. He thinks many counties might pass 100 percent of the cost savings onto taxpayers in the form of lower property taxes, but he fears that is just a trap. "Our concern, borne out of 50 years of NYS unilateral imposition of cost shifts and mandates," Gsell said, "is that just like with re-K/EI (early intervention) funding and the elimination of the counties from the AIM dollars (a state revenue share with municipalities), as the state was going to take over 75 percent of the total program cost, but they stopped at 59 percent and left the counties out to dry. "The same can happen with the Empire Equity Act in that the state holds all the cards, all the control, and always blames we locals for the abysmal state of property taxes, and they -- and he, Gov. Cuomo -- refuse to take any responsibility for the unfunded mandates and cost shifts, creating in essence a NYS property tax 'levy' within our county budgets." Cuomo has called New York a "donor state," in that it pays out $30 billion more in taxes to the federal government than it receives in benefits. He touted this bill as a way to "level the playing field." The governor backed the proposal as a response to an amendment from Collins to the American Health Care Act, which was eventually pulled from a vote by Speaker Paul Ryan, that would have prohibited the State of New York from taking money from counties to help fund Medicaid. Cuomo called the Collins proposal "a fraud." "Senator Daniel Patrick Moynihan, God rest his soul, used to talk about the unfairness that New York gave so much and got back so little," Cuomo said during a press conference on the proposal. "Second, the promises made, from Congressman Ryan to President Trump to Mr. Faso to Mr. Collins was tax relief for the working men and women of this country. Right? That’s what they all ran on. That’s what they all promised. That’s what they all said. "Well, this actually does just that. This says, 'let’s give New York additional Medicaid money because they are a donor state, let’s reduce the inequity' and New York will then give the money to the taxpayers in property tax relief." “Although late to the party, I am glad Governor Cuomo has finally seen how unsustainable it is to force hardworking property taxpayers to subsidize New York’s out of control Medicaid program,” said Congressman Chris Collins. “Unfortunately, instead of reviewing his own bloated budget for the 1.5 percent needed, the out-of-touch Governor demands more federal government for the nation's most bloated Medicaid program. posted by Howard B. Owens in batavia, Andrew Cuomo, 2nd Amendment, SAFE Act. More than 100 gun rights advocates turned out this morning in 20-degree whether at the NYSP barracks on West Saile Drive to protest the SAFE Act. As expected, Gov. Andrew Cuomo was the target of the protest signs and the speakers' rhetoric, but as it turned out, Cuomo gave the protesters a little extra ammunition when, during a radio interview yesterday, the first-term governor said, “If they are extreme conservatives, they have no place in the State of New York." More than one speaker mentioned Cuomo's statement and suggested that perhaps it's Cuomo who should leave New York and is the one out of step with the majority of New Yorkers. Assemblyman Steve Hawley also took Cuomo to task for his statement. “The governor’s comments about my constituents are offensive and are a Freudian slip, which reveals what he truly thinks of Upstate New Yorkers. He has no right to come to Upstate New York and call himself governor when he has such obvious disdain for its people,” Hawley said. “The majority of Upstate New Yorkers are pro-Second Amendment and believe in traditional family values. Cuomo's apparent lack of fondness for the people of Upstate New York is yet another reason, Hawley said, for supporting his call for a voter referendum on dividing New York into two states. For more on Cuomo's statement, see this Buffalo News article. We had a request to purchase these photos, so, for anybody who would like to purchase prints, click here. posted by Howard B. Owens in GCEDC, Andrew Cuomo, Batavia Towne Center, COR Development. During the "gaggle" (that's what reporters call it) with Gov. Andrew Cuomo following his speech at GCC yesterday, I asked him specifically about Genesee County Economic Development Center providing tax incentives to the retail project at Batavia Towne Center. In these mini-press conferences, reporters are only given enough time to ask a few questions and it's difficult to ask follow-up questions, so I fumbled through my question (which really should have been a two- or three-parter), trying to cram in as much information into a short time as possible (and it was still a pretty long-winded question). Another media outlet has reported that Cuomo was critical of the retail tax subsidies given to COR. The quote used: “It wasn’t the smartest investment of money." The quote, in my view, is being taken out of context. Your case is fact specific and I would have to look at the actual facts to see what they did. We had proposed IDA reforms. I believe there are economies that I can find there and I believe there are incidents where you can find it wasn't the smartest investment of money. That's why, that's one of the reasons I like the approach we're talking about here today. It's simple. It's clean. It doesn't have a lot of bureaucratic red tape. It's very easy to administer. Very few government officials required to administer it. So I think it's preferable to a lot of things we've done in the past. Included in Cuomo's budget was a reenacted law meant to curtail IDAs providing tax breaks to retail projects. I asked Cuomo what the intent of that law was. He said, "Just improve the process and address the kind of abuses you've been talking about." He then said thank you and turned and left. I didn't report any of this because I didn't find it particularly newsworthy. He couldn't address the specific local issue (hardly surprising, but I had to ask) and his answer to the more general "intent" question referenced my own question, which by his own admission, he didn't know much about. That seemed like a kind of circular logic that didn't make a lot of sense. However, given that another media outlet used the quote, and though I don't mean to be critical of a fellow reporter, I feel obliged to put the quote in context. posted by Bob Harker in politics, business, taxes, Andrew Cuomo, ny. "ALBANY, N.Y. (AP) - Chief Executive magazine ranks New York as the49th worst state for business in the opinion of CEOs questioned. The ninth annual survey of CEOs blamed New York's high taxes, bureaucracy and a regulatory system that is difficult to navigate. The CEOs ranked New York just better than California. Most larger states with strong labor unions faired poorly in the rankings. CEOs liked Texas most for the ninth straight year, followed by Florida, North Carolina, Tennessee and Indiana. The ranking comes as New York Gov. Andrew Cuomo is continuing a "New York Open for Business" campaign with TV ads that say the Empire State is now far more welcoming of business and employers. A Cuomo spokesman notes the state is now at its highest work force size ever." posted by Howard B. Owens in batavia, genesee county, Andrew Cuomo, pensions. Gov. Andrew Cuomo has proposed a program that would help local governments save on near-term pension costs, potentially relieving local administrations of a major budgeting challenge, but both County Manager Jay Gsell and City Manager Jason Molino are reacting to the news with some caution. Molino said until he can fully study the budget bill, assuming this provision even moves forward, he can't really comment on it. He isn't yet ready to agree with the governor that the city will realize $3.1 million in pension savings over the next five years. In a press release yesterday, Cuomo isn't promising local governments that they will completely avoid the pension expense, just some relief from near-term pension cost instability. Under the plan, localities are given the option for a stable pension contribution rate that significantly reduces near-term payments but still keeps the pension systems fully funded over the long term. Local governments which opt in would avoid significant volatility in contribution rates and be better able to plan for the future. Though the locality receives short-term relief, because the contribution rate remains fixed, the total amount paid into the fund by the locality would not be diminished over the life of agreement, thereby maintaining the fiscal stability of the pension fund. While over the next five years, Genesee County could receive a $11.5 million benefit over five years under the plan, Gsell is also keeping the proposal at arm's length. On the surface it is intriguing, but there are concerns as to the back-end balloon escalators in 10 to 25 years and what Comptroller Dinapoli will do every 5 years to "protect" the retirement system dollars is a major note of caution. This could be the NYS version of the Titanic iceberg, only it involves our budgets and employees retirement assets. Once the full details and not just the second-floor spin are revealed we will look at our pay-as-you-go options. A year ago, Albany enacted a Tier VI retirement plan, which covers only new hires by government agencies. The plan will supposedly greatly reduce local government pension costs, but not for decades from now. What Cuomo is proposing now is to shift those savings so local governments can realize some benefit from Tier VI in the near term. In the press release, Cuomo hails the plan as a major step toward helping local governments. "The difficult financial pressures facing localities are well-known here in Albany, and my administration from day one has been committed to helping local governments meet their budgetary obligations as well as continue to provide critical services to their residents," Governor Cuomo said. "While the Tier VI reforms were a major step toward helping local governments deal with the pension crisis, we understand that more help is needed. For this reason, the Executive Budget proposed the Stable Rate option to offer local governments and schools a bridge to the long-term savings of Tier VI, as well as greater predictability." posted by Howard B. Owens in Andrew Cuomo, 9-11, kathy hochul. "On this day, we mark the eleventh anniversary of the terror attacks that claimed thousands of lives and truly changed New York and our nation forever. On this day, we honor the memories and the lives of those who were killed and the families who will never forget them. We also honor the first responders who bravely put themselves in harm’s way – many of whom never returned home. "It is also our obligation and our duty to make sure that we will always remember. As a new generation grows up without having witnessed the horror of September 11th, it is important to educate our children so they can understand the tragedy that unfolded on that day, the bravery and courage of our first responders, and the outpouring of goodwill in communities across New York and America as we recovered as one state and one nation." “Today as we mark the passing of another year since the September 11 attacks in 2001, we honor those we lost on that day. We recall the innocent victims taken too soon, the courage of the passengers who prevented further tragedy, and those first responders, who in doing their jobs, laid down their lives to protect their fellow Americans. “What grew from this tragedy was an all encompassing spirit of patriotism, bonding our nation together in common purpose to move our country forward. Our endeavor today is to find that spirit once again. We must recognize that so much more binds us than divides us, and as Americans we are capable of solving the challenges of our time. posted by Howard B. Owens in crime, Andrew Cuomo, synthetic drugs, bath salts. Local officials welcome new NYS Health Department regulations cracking down on the sale and possession of synthetic drugs, but also say the new rules are no substitute for aggressive legislation from Albany. Gov. Andrew Cuomo made three stops across the state today to announce new rules against drugs he deemed more dangerous than crack cocaine or methamphetamines or heroin. “It is a new face on a very old enemy. It’s an enemy that we fought decade after decade. The enemy is drugs, and it’s an ongoing battle. When you beat one manifestation of the drugs, it comes back in another form, sometimes more virulent. Unlike a previous health department ban on synthetic cannabinoids, which allowed only for civil penalties, the new emergency regulations give local police officers the power to arrest people found in possession of banned substances. If convicted, a person caught selling or possessing one of the banned substances could be fined $500 or serve 15 days in jail, and while the new regulation (PDF) allows for multiple penalties for a shop owner caught with several packages of drugs, District Attorney Lawrence Friedman said he's concerned the new rules won't have the desired effect. "When you consider the harm that we know is caused by these substances, I would like to see more teeth in the law," Friedman said. When The 420 Emporium stores, along with the residence of the owner(s), were raided by the DEA on July 25, agents recovered more than $700,000 in cash. Friedman said thinks the penalties need to be harsher than just a $500 fine, even if the fine and jail time can be strung together. Sheriff Gary Maha expressed some of the same reservations. Maha urged the Legislature to pass a bill that would make the sale or possession of synthetic compounds a violation of the law under the state's penal code, rather than just a violation of the public health law. "This appears to be a 'Band-Aid' approach until the legislature enacts such legislation," Maha said. "It helps, but is not enough." The new regulation bans a dozen specific compounds associated with the type of synthetic drug commonly known as "bath salts." While the state has already listed some "bath salt" compounds as controlled substances, the state doesn't have a comprehensive "analog" law (a law that bans substances that are the same or similar to already illegal controlled substances). The new regulation does specifically cover analogs of banned substances. It also covers a wider variety of the more than 450 known synthetic cannabinoids. While the regulation specifically states employees of stores selling such products can be prosecuted, the store owners (anybody with an ownership interest in the store) are also held to criminal liability even if not present at the time of sale. Besides the fine and jail time, a store owner could lose his business. Batavia PD Chief Shawn Heubusch wasn't available for comment today, but City Manager Jason Molino said the health department's new regulations were a topic on conversation today in a meeting between city staff and the county health department. Molino said that while the new law seems to lack teeth, it is a step in the right direction. He also pointed out that tonight is National Night Out and several neighborhoods in the city are actively participating, including the neighborhood around Pringle Park, which organized its own event this year. "When neighborhoods get together, that is your more powerful enforcement tool," Molino said. How is this a "cut"? posted by Bob Harker in Andrew Cuomo, nys taxes Governor, NY Politics. AP) An early list of proposals from a task force redesigning the most expensive Medicaid system in the nation seeksto charge hospitals and nursing homes more as a way to cut New York's cost. The above appeared on a Rochester news site, The link for the full article appears below. How in the world is charging hospitals and nursing home morea cost cutting move?!! After wooing the state's taxpayers with a speech revolving around a redesigning the way state government works, it seems the old doublespeak is alive and well. It seems the governor does not have the guts to say that he isconsidering cutting aid to these facilities by 750 million bucks over two years. Instead, he buries this fact by creating a charge back instead. Any bets the chargeback will be called a fee? posted by Howard B. Owens in schools, elba, Andrew Cuomo. Sam Lamont, a student in Elba, was selected to attended Gov. Andrew Cuomo's State of the State speech earlier this week. He was one of 62 students selected from throughout New York. The Elba Central School District was asked by the governor's office to select one of its student. Sam was selected because of his leadership qualities, involvement in the community and was a Boy's State representative last summer. Above, Sam is pictured with his parents, Skip and Mari-Ellen Lamont. Below is his report on attending the event. Being chosen to attend the "State of the State Address" was an honor. This was my first trip to Albany and yes it was impressive. This was a moment in history. Seeing Governor Andrew Cuomo outline his plan to bring New York forward and reduce spending was inspiring and rang true with those present. He is an emotional speaker and today, in Albany, it didn't matter if you were a Republican or Democrat. He does care about the future of our state. Rochester's own Robert Duffy, taller than I had expected, gained the respect of everyone in the room. As I sat on the stage, I was immediately impressed by the number of black power suits and the presence of the press. Cameras were everywhere. It seemed everyone was making contacts and later being interviewed as to their opinion of the speech. The receptions were filled with a cross section of New Yorkers looking forward to a canoli or cheesecake while discussing politics. I came to the realization that Albany is a powerful place and those individuals in dark suits are many of our elected officials. They are powerful people and are decision makers in our future. Let them hear your viewpoint; vote, contact your representatives and be informed. posted by Howard B. Owens in new york, Andrew Cuomo. Mr. Cuomo proposed to freeze the salaries of the vast majority of public employees for one year, to limit new spending to no higher than the rate of inflation, to limit school property tax increases and to “hold the line” on taxes in general. Cuomo pledged to cut spending, consolidate agencies and reform programs such as Medicaid. In today’s State of the State Address, the governor acknowledged the dark times ahead, but looked to a brighter future on the horizon. Many of his cornerstone proposals, from a property tax cap to an independent redistricting commission, have been advanced by the Assembly Minority Conference for years. What we must do now as state legislators is change the way we operate in Albany and run state government like a private-sector business. We need to find savings in the state budget through consolidating state agencies and ending optional Medicaid programs that other states do not offer. Unfunded mandates that force localities to raise property taxes and drive our families across state lines must be repealed immediately. Powerful job-creating programs like IDA’s need to be embraced, not ignored. I am eager to work with the governor to accomplish these goals that will improve the quality of life for Western New Yorkers. Today, the Governor’s State of the State address echoed opinions of so many New Yorkers, including myself – especially for the state to close the budget deficit, impose a property-tax cap, and create private-sector jobs. I have been an outspoken advocate and introduced legislation on many of these issues during my first term and I am pleased to hear the Governor make them his major legislative priorities. More importantly, New Yorkers have been demanding property tax relief and a smaller and leaner State government over the past few years as well. The governor’s message today was one of change, coming together, and hope for a prosperous economic future for the Empire State. During his State of the State, Governor Cuomo mentioned his idea of creating 10 Regional Economic Development Councils (REDC’s) throughout the state which will be chaired by Lt. Governor Bob Duffy. Genesee County has continued to grow and strategically invest to develop shovel-ready industry specific sites for medical devices, food processing, distribution logistics and high-tech advanced manufacturing companies. A mega site, Western New York Science, Technology, Advanced Manufacturing Park (WNY STAMP), is under development in Genesee County, Alabama, NY and has the ability to transform Western New York. Hyde is convinced that STAMP will be a contender in the competitive funding pool that the governor announced. Funds will be allocated to the most innovative and creative regional job creating initiatives. The WNY STAMP project and the Buffalo East Tech Park in Pembroke, NY, have the potential to bring 11,000 jobs directly into Genesee County and add an additional 27,000 jobs through the supply chain impact between Buffalo and Rochester. Potentially, the REDC will assist to promote WNY STAMP and bring the project to a reality for Western New York. Governor Cuomo's property tax cap plan is a much needed New Year's resolution for New York State farmers. Because of our land holdings, property taxes are killing us. We love the governor’s plan to cap taxes at 2 percent. Also, we love the cap because it's coupled with a recognition that long-term restructuring is needed to Medicaid, government consolidation and education reform. Equally exciting is his mandate relief program, which will help shrink the massive tax burden local municipalities are forced to levy against its residents and businesses. The governor made it clear today, as he did throughout his campaign last fall, that agriculture will be a central factor in his effort to revitalize the economy. We are grateful for his vow to help get more New York-grown food into the New York City market. This is a no-brainer. This idea will benefit farmers as well as city residents who will have greater access to fresh local produce and dairy products. We applaud his support to renovate the Hunt’s Point Terminal Market, which is a vital resource for farmers to deliver produce into the New York City market. We’re looking forward to working with Lt. Gov. Duffy in his role as advisor to regional economic development councils. He’s already visited my farm and many others over the past several months. He has demonstrated a clear recognition of agriculture and its role in the economy and culture of Upstate New York and Long Island. Governor Cuomo and Lt. Gov. Duffy have pledged their commitment to the farm families of New York and we’re looking forward to working with this exciting new administration. posted by Howard B. Owens in batavia, politics, Democrats, Andrew Cuomo. Attorney General Andrew Cuomo made a campaign stop -- he's running for governor -- in Batavia this afternoon at Larry's Steakhouse on East Main Street. The room was packed with local Democrats and several members of the media. We'll have more coverage later. UPDATE: My digital recorder failed me. I was planning to post an audio of Cuomo's speech, but the file didn't save right. All I have is his meeting with reporters (audio starts just after a TV reporter asked about his plans for the lieutenant governor). There are more pictures after the jump. posted by Chris Charvella in Andrew Cuomo, Genesee County Democrats. The Genesee County Democratic Committee will be having grand opening party at their campaign headquarters, 10 City Centre Batavia at 6:30pm Thursday October 7th. Special guests will include State Senate candidate Marc Coppola, multiple candidates for the 8th District State Supreme Court and other local elected officials. Light refreshments will be served. posted by Dave Olsen in politics, Andrew Cuomo, ny, Governor race, Rick Lazio. I will try to listen to it tonight, as I have things to do now. posted by Bea McManis in New York state, Andrew Cuomo, Blogs, Democrat Rural Conference. Genesee County was well represented at the Friday night session of the Democrat Rural Conference in Niagara Falls with 12 members attending. Andrew Cuomo sparked a gread deal of interest and let the Rural Conference know how much he appreciated their continued support. “In this Democratic Party, there is no place for government corruption, period. This government has betrayed the public trust. He spoke about “activist groups” that he said will seek to try and divide New Yorkers who are, by and large, “afraid.” The tea party has already begun to attack Cuomo and were present, in front of the Crowne Plaza with signs supporting Paladino. As an aside, it was interesting watching how the tea party group (of about 15 people) worked the media. They had an organizer with a bull horn. Anytime he saw someone standing in front of a camera for an interview, he would direct his 15 people to run over and picket behind the person being interviewed. First they would all run to one corner, then be directed to the opposite corner. Then back in front of the hotel. I took particular notice of the 10521 governments in New York State because this has been a topic of discussion on thebatavian quite often. A real reason to take a look at consolidation. Included in that number were state, county, city, town and village governments along with utility districts. Governor Patterson hosted the opening reception, Senators Schumer and Gillibrand the banquet for about 500 guests, and Cuomo hosted the dessert. The straw poll will take place today, Saturday.